If your hubby is anything like mine, the one thing that he insists on in our house is a large TV and a comfy seat to go with it. However, the problem arises that they are just plain ugly from a design standpoint. But I’ve come to terms over the years that it is an art form to learn how to decorate around a tv. 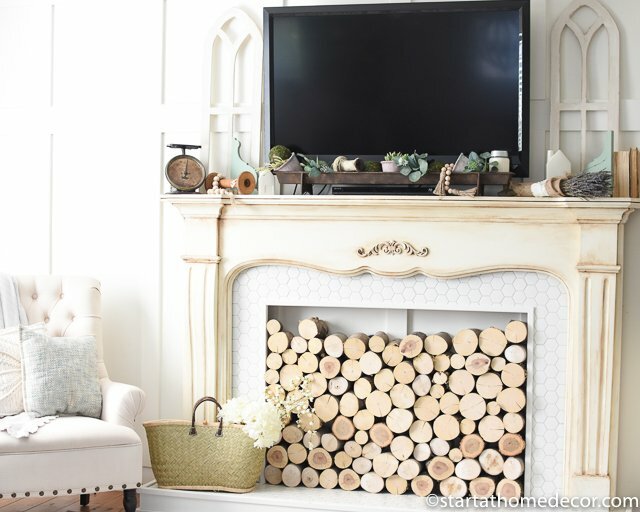 So, I’ve rounded up several decorating possibilities, thanks to the inspiration from bloggers who have taken the task and conquered. 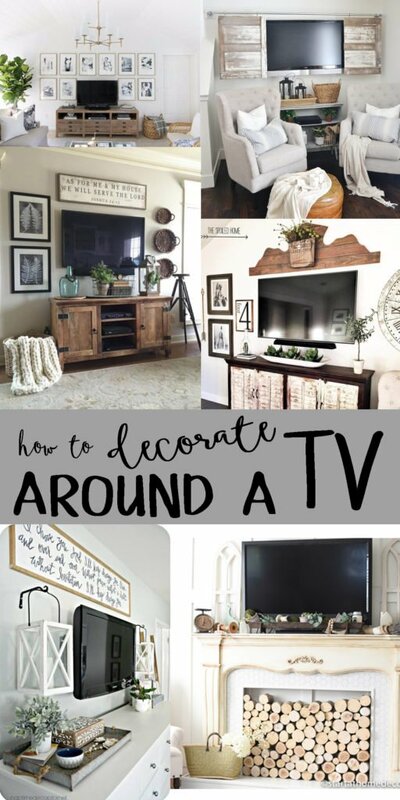 Check out these amazing rooms and use a little inspiration to give your TV wall a makeover it truly deserves. First of all is my family room TV. I am kind of embarrassed to say it took me over a year to get it just right. When I find that one perfect item the rest seems to snowball. I found that trough at a vintage market that was perfect for hiding my DVD player. To complete the look I used my windows for either side to balance it and then I filled in with fun decor items! Easy enough, right?! 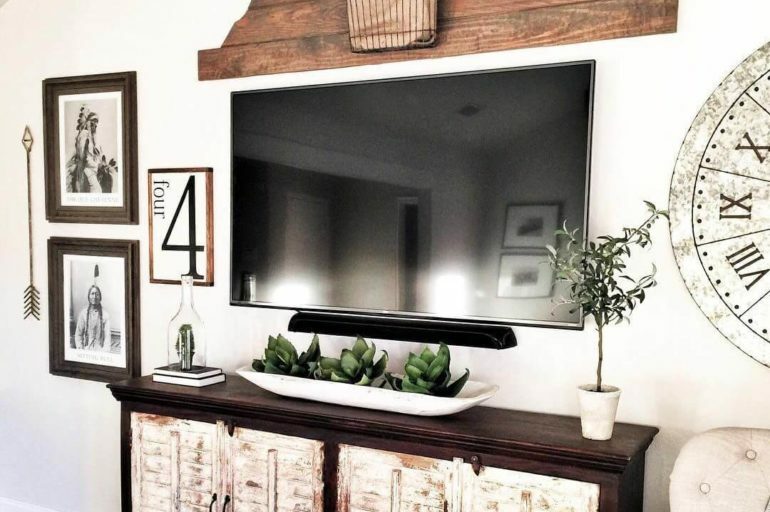 Currently Chic Boutique framed their TV! And it looks AMAZING. Why have I never thought to do this? 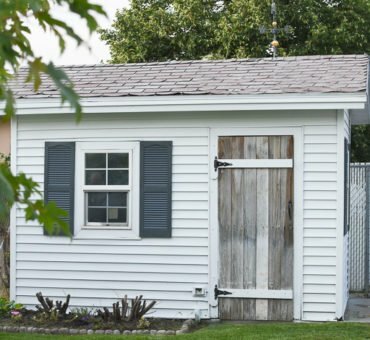 It sits perfectly against a shiplap wall with cute farmhouse decor underneath. Perfectly chic, in my book. 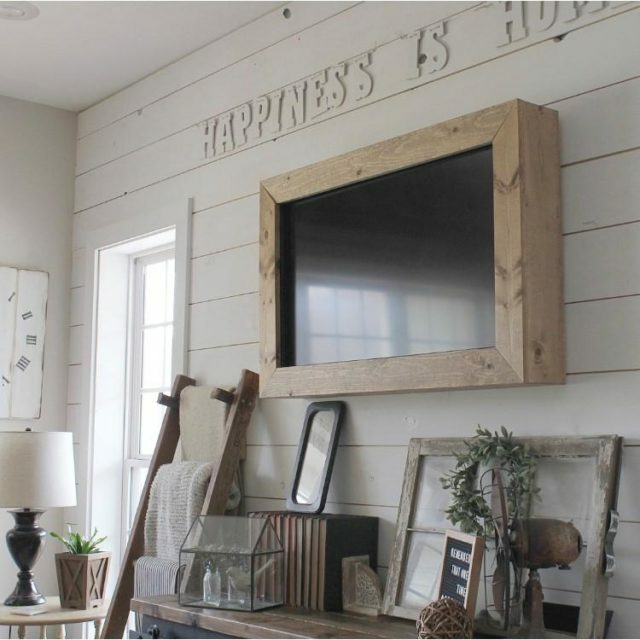 This TV wall from Naptime Decorator looks especially stunning amidst the suspended hanging lanterns and quote on top. Another option is the built-in shelving that has transformed this space on both sides. This designer has taken an ugly wall and given storage and design all in one. 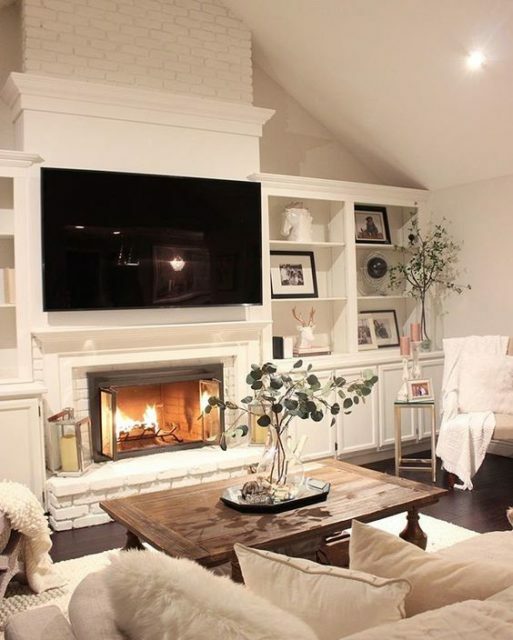 Built-ins are a great option if you want a more permanent feature, making and the space seem bigger than it is, likewise making the TV appear smaller as well. 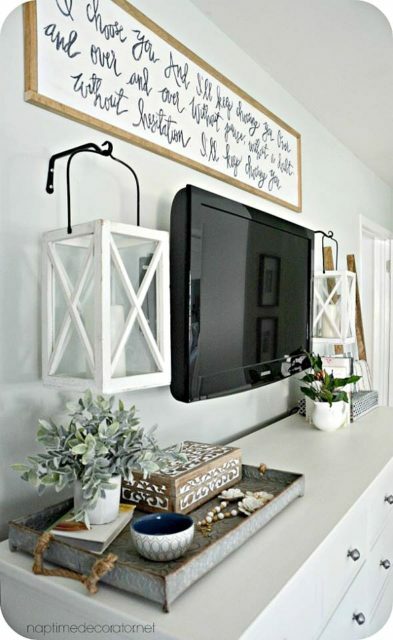 Alicia from Our Vintage Nest has styled her TV wall perfectly! 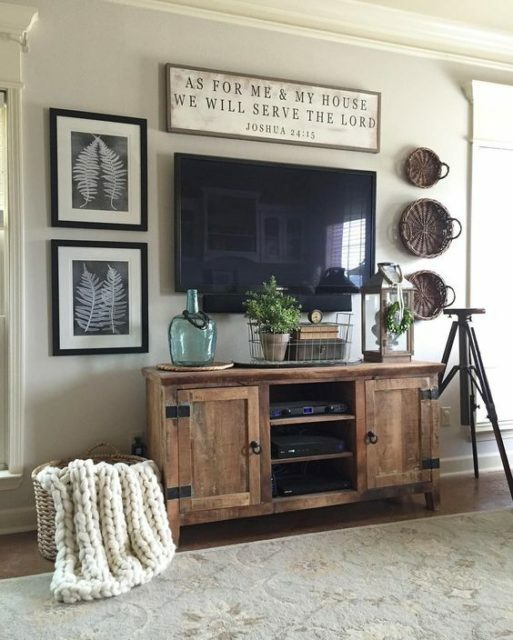 I love the rustic decor surrounded by frames, baskets, and quotes. Consequently, it makes the TV look like part of a collage wall and blends in so much better. Next up? Hiding your TV behind industrial pipe sliding bard doors. Liz Marie is a certainly genius!! And bonus – it just looks like wall decor when it’s closed! 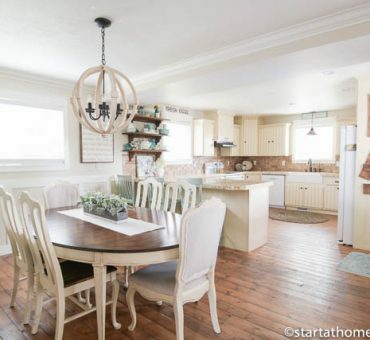 Also, I love this rustic set up from The Spoiled Home. 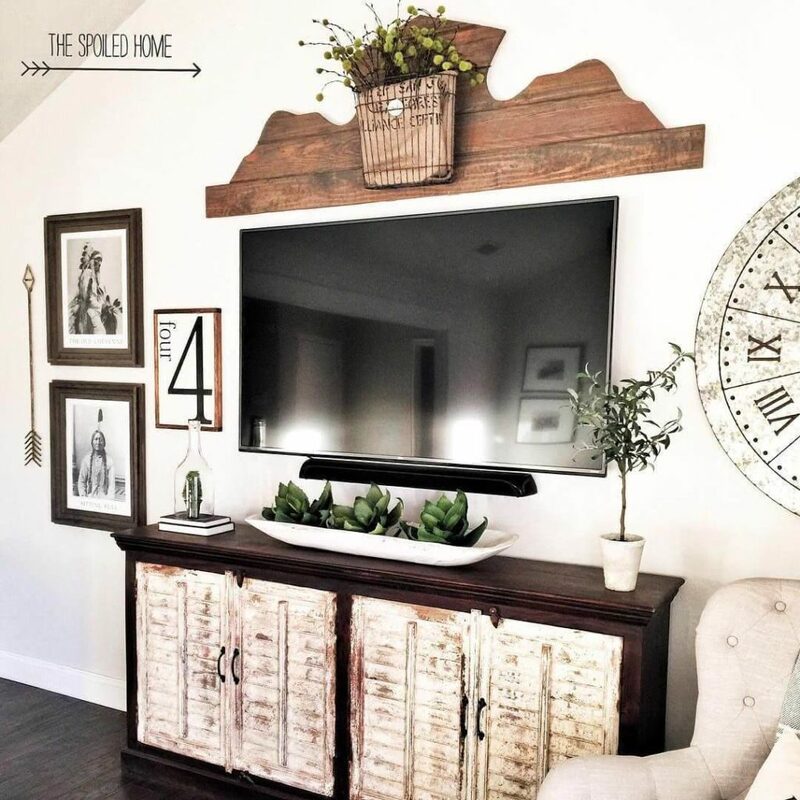 The TV is framed by a gorgeous wood piece above and then surrounded by Native American pictures, a clock, greenery and other rustic elements. Finally, this wall is another great option from Driven by Decor. 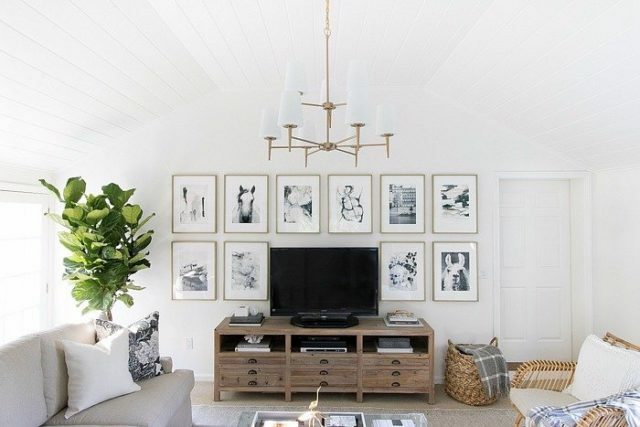 She surrounded her TV with black and white framed prints that make this space look so great. It’s a simple concept, but executed beautifully! 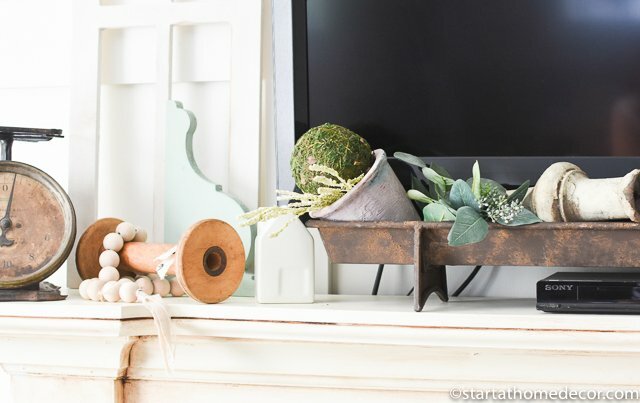 Trying to decorate around a TV doesn’t have to be difficult. And, it can actually look good from a design perspective. 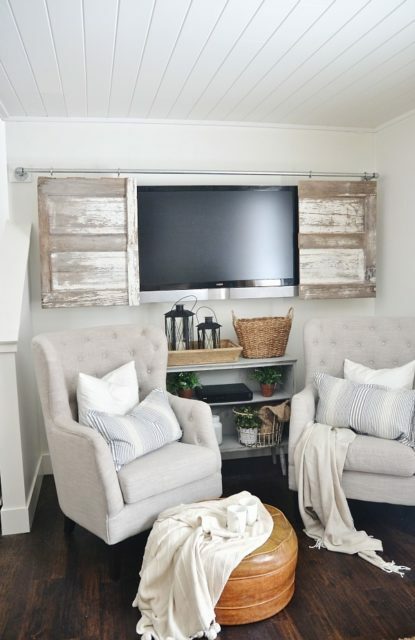 Try one of these ideas for a truly awesome TV makeover!